I’m really REALLY excited to tell you guys about my latest find on SS today. 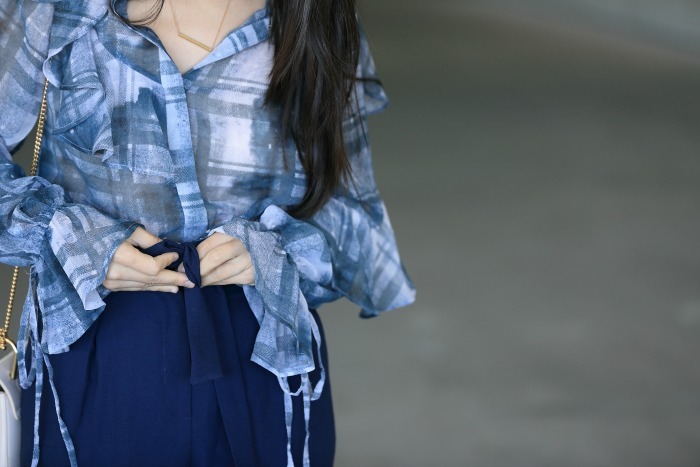 I purchased this adorable ruffle blouse on ASOS a few weeks back, and it’s seriously the cutest ever. It’s made of a lightweight woven fabric and looks great with anything and everything. Tuck it into high-waisted pants like I did for a chic office look or wear it with jeans for a sophisticated casual ensemble. The top’s super fashionable as is so you don’t have to put in much effort to look good – currently available for $30.50 online. In case you’re wondering, my pants are new as well, and like my top, they transition beautifully from work to play. They’re stretchy so they’re ridiculously comfortable to wear, and the high-waisted cut is extremely flattering aka no muffin top. I kept things simple on the accessory front because I didn’t want to overwhelm. I carried my neutral Chloe bag and threw on beige heels to match. Then, I finished things off with my new necklace courtesy of Starfish Project. If you’re not familiar with their brand yet, you need to seriously check them out. Not only do they offer beautiful jewelry, their cause is beyond noble. They provide life-changing opportunities to trafficked women in Asia, giving them vocational training, healthcare, shelter, counseling and education grants to victims and their children. They’ve employed over 100 women thus far and have served thousands through their community outreach services. Read more about their amazing mission and support them by shopping their site or donating. Photographed by the wonderful Sung Shin.